Construction : The construction of the kit is smooth and easy most of the fittings and plastic component fits well into their placement parts. Very little surface and filler is required in the construction stage of the kit which makes the assembly of the ship very fast. 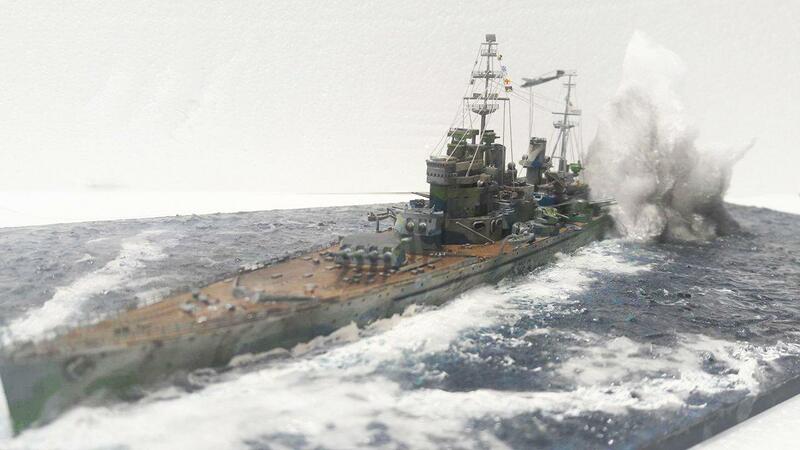 The deck and moulding of the battleship is fine with the Photoetch from Flyhawk is used to create more detail effect to the whole battleship which would increase its realism. 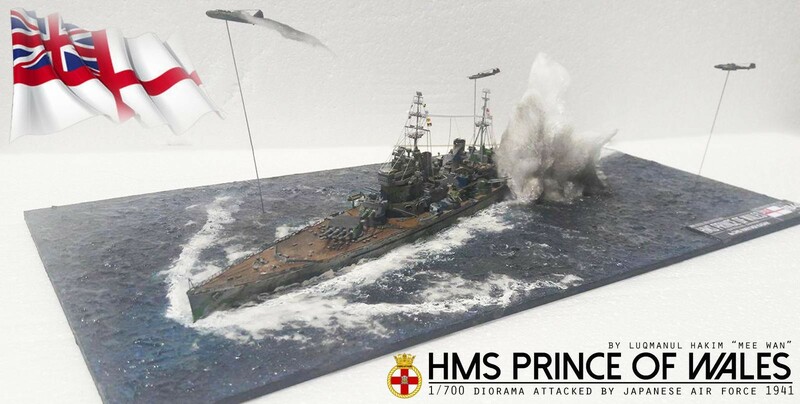 Since its a diorama build depicting the attack of the Prince of Wales in Dec of 1941 the ship is attached to the modelling paste filled board base before the sea and ship is painted seperately to be more increase the clarity of the build. 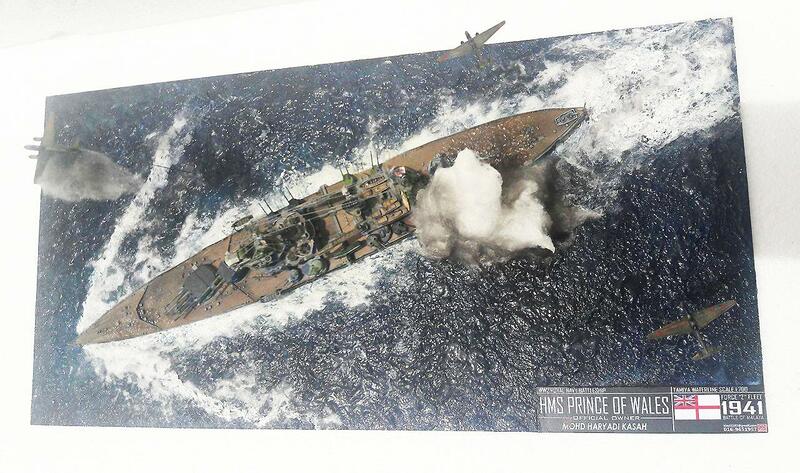 Painting Work : The painting work of the camo of the Prince of Wales is made into four main colour the base colour is natural grey followed by sea gray blue and patches of light green camo colour finally small stripes of black and white stripes pattern based on the reference on certain pictures and actual reference photos.The deck is coloured with wooden deck brown and certain detailing works on the guns and railings. Once the basic main paint is done with weathering of battleship is done using AK Interactive rust set and tamiya accent panel lining which is faded using AK Interactive enamel spirit. 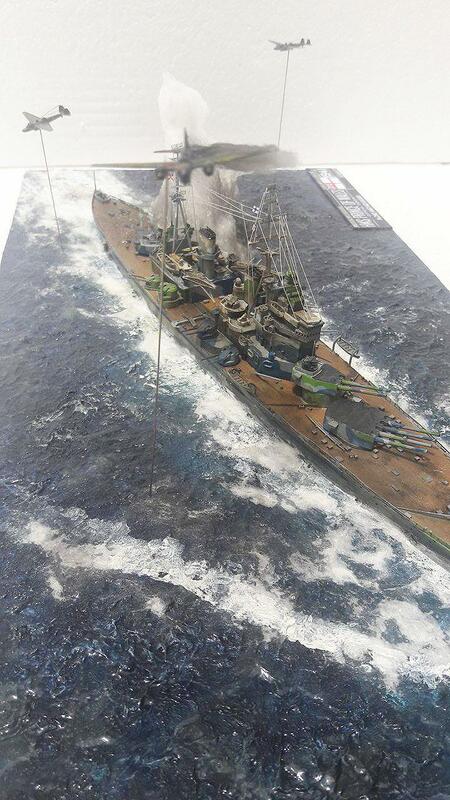 As for the sea base diorama modelling paste is inserted on the sandwich board until it dries which takes about 2 hours. Then apply blue colour paint on the surface and wait until it dries. The next process is inserting the battleship onto the base and using Vallejo water texture to apply on the base for the glittery shiny water effect. 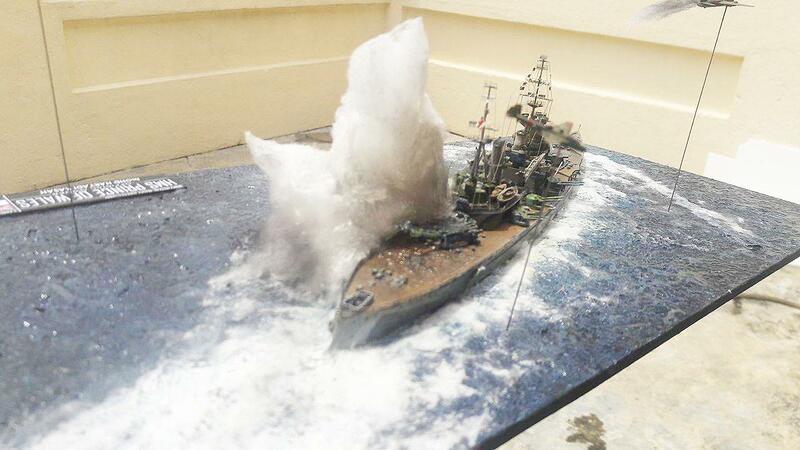 Using cotton and white colour brush the wave is made base on certain generic wave reference together with the torpedo explosion effect. Last but no least inserting the bombers (Nell & Betty) used by the Japanese on the raid on Force “Z” using metal sprues. Conclusion : Overall it was a stunning experience making the whole diorama I believe new lessons were learnt in this process of making it. 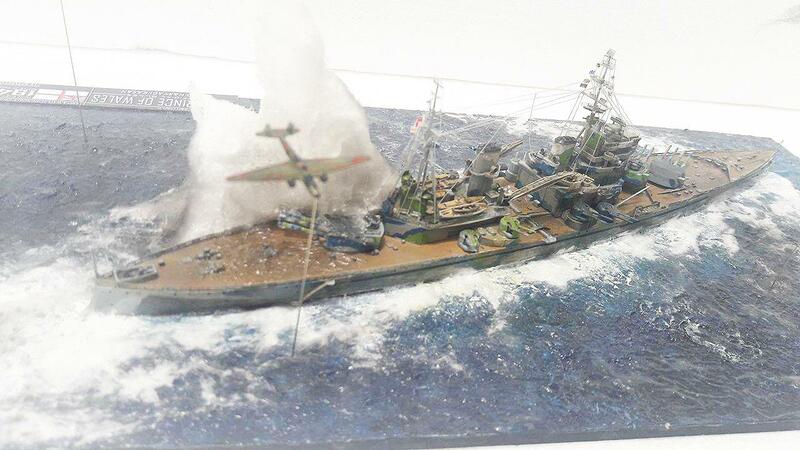 I hope I did the best I could to depict the actual attack scene of the event which is very rarely documented in actual photos and model diorama. 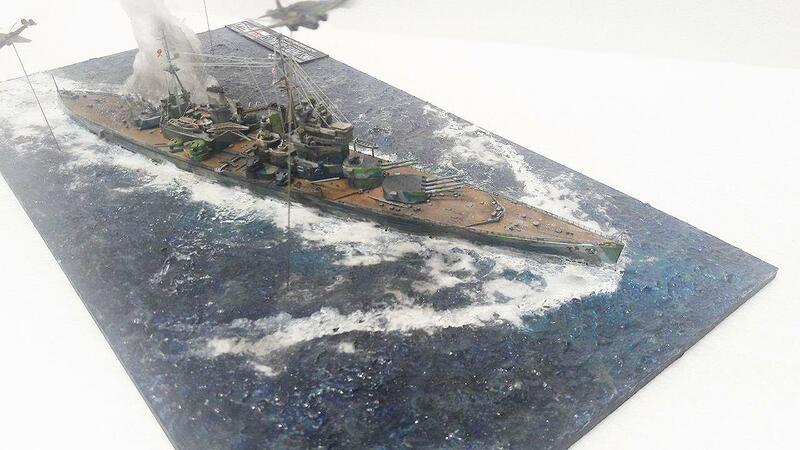 I hope that my diorama would be the pinnacle reference for others to help in their project of this battle scene. Thank you. Very nicely done, sir…great job! Welcome to the site. 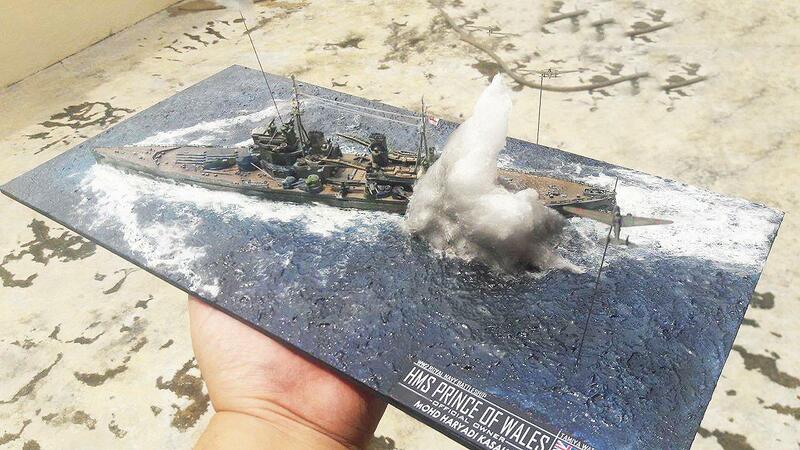 Amazing work in 1/700. That explosion looks real. Mee Wan, I don’t know how you ship guys do it, but I really admire your excellent work. You have brought about a very realistic look, Well done ! Hello Mee Wan, and welcome onboard at iModeler. 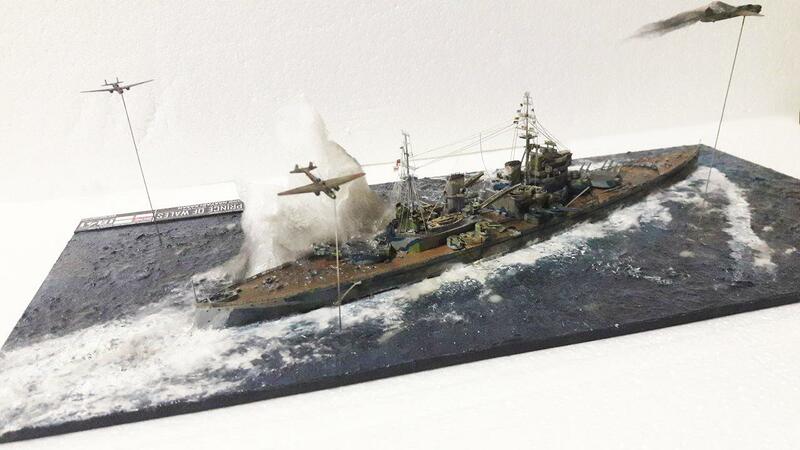 That’s a fabulous first entry… great work on the diorama, and the sense of action (IMHO one of the hardest things to achieve in a dio) is very realistic. We hope you’ll enjoy this community and hope to see more of your modeling soon! hi…yes will post more of my miniature works … thanks ! Unbelievable what you accomplished in this scale. Very realistic. My compliments. This loss was the turning point in the “battleship only” thinking of the British Admiralty. John Leach, the commanding officer went down with his ship. His son Sir Henry Leach, Chief of the Defense Staff in 1982, would advise Prime Minister Thatcher to send a Royal Navy task force to the South Atlantic in 1982, to recapture the Falklands. hi Dirk ….thanks for the compliments ! Great history lesson, Dirk! Thanks for letting us know about the Captain’s son, Sir Henry Leach. VERY interesting. Mee Wan. Well done…great presentation. Fantastic modeling, especially in 700. I love everything about this build; the water is perfect, building is amazing, the painting is so realistic and your writing/description is really helpful. 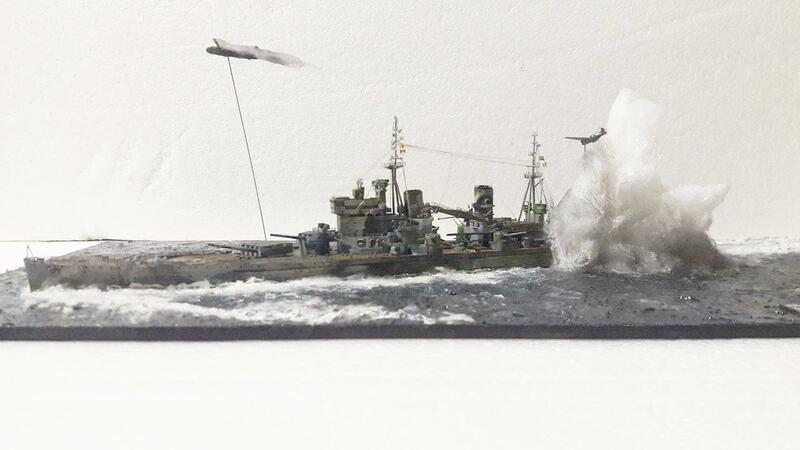 An excellent model/diorama! Love the sense of action captured, and the modeling work is superb. Well done – and welcome aboard! What a great build! Great presentation too. So realistic! Gotta feel bad for those poor sailors. 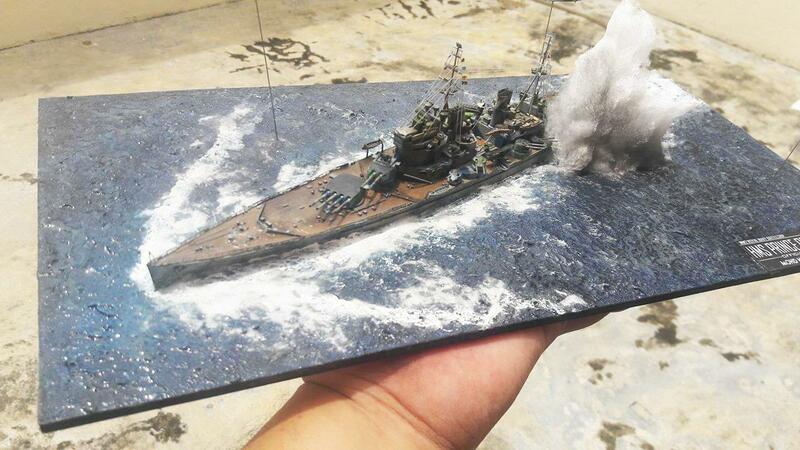 Exceptional diorama, Mae Wan. Your detail work is outstanding. A real pleasure to see!